You are here: Home » Market News » Best Rates » Where Your Emergency Savings Should Start At? Where Your Emergency Savings Should Start At? Having an emergency fund or emergency savings gives a certain peace of mind. You know that there is money set aside for unforeseen expenses and feel more confident looking into the future. However, its easier to say than fund emergency savings. But today, having emergency savings accounts is set as a top priority by many people. So, what is that magic amount that will allow you to stay aloft in case the unexpected occurs? Some expert say that the emergency fund should start at about $500. However, this amount mainly depends on your income and cost of living. First of all, you need to determine those unexpected situations you need the emergency fund for. It can be car repair or los of job, or medical expenses. Secondly, look at your lifestyle: the appropriate amount will be different for a student, family or a single mom. 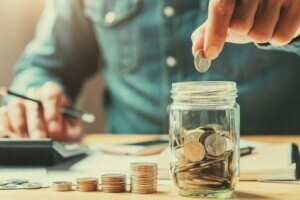 It is recommended to put away at least 5 percent to 10 percent of each paycheck until your savings reach three to six months’ worth of expenses. Many people keep their emergency funds in either savings accounts or money market accounts. The experts, however, recommend dividing the emergency fund between three accounts. Checking account is good for savings that are worth one or two month’s expenses. Savings accounts are better for two to six months’ worth of expenses, and CDs are for bigger emergency funds, like up to 12 months’ worth of expenses. Note that all your emergency savings should be invested in cash or cash equivalents that won’t be exposed to risk. Make sure your savings are protected, insured, and you can access money as soon as you need it. You can manually fund your emergency savings each month but it requires time, dedication and discipline. The easiest way to deal with all that hassle is to automate the process. Thus, you will make the decision once and for all. You won’t need to force yourself to make the decision each month, your emergency fund will be funded automatically. Comparing banks choosing the best one is good but, frankly speaking, any bank will work to start saving – your goal is to save, not to analyze. Today a lot of online banks without brick-and-mortar storefronts tend to offer the highest interest rates. Emergency funds are important, but do not forget about your savings goals. When your emergency fund reaches a comfortable number, redirect your savings toward other financial goals such as retirement, paying off debt or funding a 529 plan for college. – How much to save depends on your income and lifestyle. – An emergency fund should be invested in cash or cash equivalents that won’t be exposed to risk. – Put away at least 5-10% of each paycheck until you’ve saved three to six months’ worth of expenses. Best Rates: Where Your Emergency Savings Should Start At?